Welcome to Journal of Applied Economics and Business Research (JAEBR), now indexed in Emerging Sources Citation Index (ESCI), Web of Science of Thomson Reuters! JAEBR is a quarterly, peer-reviewed, open access, academic journal published in Canada (ISSN 1927-033X). The journal devotes special attention to emerging markets economics, but it is open to high-quality papers from all fields of applied economics, business and finance. We prefer empirically oriented papers, but do not exclude review articles or theoretical contributions provided that they are of high quality and relevant to the journal’s aims. Among empirical papers, we prefer those that are relevant to a broad international audience, i.e., papers covering a range of countries or analyzing topics that are clearly relevant outside a single country. The journal is particularly interested in empirical papers with significant policy implications. 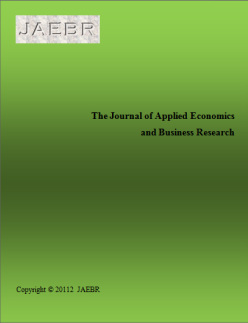 Journal of Applied Economics and Business Research is aimed primarily at economic policymakers, business circles, academic researchers, university teachers and students, economists working in the public and private sectors, financial officers, and financial consultants. JAEBR is an open access journal which means that all content is freely available without charge to the user or his/her institution. Users are allowed to read, download, copy, distribute, print, search, or link to the full texts of the articles in this journal without asking prior permission from the publisher or the author. This is in accordance with the BOAI definition of open access.